Family Elaegnaceae Juss., genus Hippophae L.
It is a shrub or small tree with thorny branches. The height of the plant is 2.5-8 m; the average diameter of the trunk is up to 20 cm. The thorns are 3-9 cm long. Leaves are narrow, linear; the upper sides are grayish-green, and the lower sides are silvery with white scales. The root system is mainly superficial, stretching from the trunk 10-12 m. Flowers are monosexual; plant is dioecious. Male flowers are in the short spikes near the base of young branches; female flowers are singles. Blossoming occurs at the end of May. Fruits are orange or reddish, single-seeded, berry-like and up to 1 cm long. Fruits ripen at the end of August. The origin of the species is East Asia. It was cultivated in Russia as an ornamental plant beginning in 1850. Special Sea Buckthorn farms were created in the 20th century in the Altay region, Burjatia, Krasnodar region, and Zhitomir oblast. Plantations were distributed throughout the Nechernozem zone: Kirov, Br'ansk, Rjazan', and Moscow oblasts. Also, there is a plantation in the Ural region. 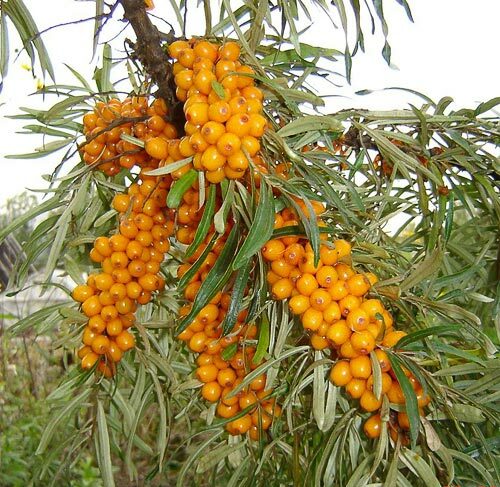 The introduction of Sea Buckthorn into culture goes along with the use of natural brushwoods in Altay region, Burjatia, and Tuva. This is a flexible species, and, therefore, it is found in practically all natural zones of the Northern hemisphere. This is a frost-resistant and heat-resistant plant. Photophil. Prefers light, drained soils, but with enough moisture and calcium. It does not need much nitrogen, because nitrogen-fixing actinomyces live on the roots. It produces fruits after 3-6 years. Its lifespan is 30-40 years. It is a valuable food plant. It contains vitamins, sugars (up to 6.6%), organic acid (up to 2.5%), and fatty oils (up to 9% in pulp and 12% in seeds). It is cultivated on several thousand hectares in Siberia. Harvest includes 7-9 kg (up to 16 kg) worth of berries per tree, and 4-6 (up to 12) tons per hectare of plantation. Most popular varieties include: Dar Katuni, Novost' Altaja, Zolotoj Pochatok, and Vitaminnaja. It is a food, honey, medicinal, industrial and fodder plant; also, it is used as a wood source and ornamental plant. Grubov V.I., ed. 1986. Areas of trees and shrubs of USSR. V. III. Leningrad: Nauka. 179 p.
Kalinina I.P., ed. 1970. Sea Buckthorn in culture. Barnaul: Altay Board of NTO of Agriculture. 122 p.
Koropachinsky I.Y., Skvortsova A.V. 1966. Trees and shrubs of Tuva Soviet Republic. Novosibirsk: NAUKA. 184 p.
Kozhevnikov A.P. 2001. Sea Buckthorn on Ural. Ekaterinburg: Ural branch of Russian Academy of Science. Botanical Garden. 128 p.
Malyshev, L.I. & G.A. Peshkova. 1979. Flora of Central Siberia. V. II. Novosibirsk: Nauka. Mishurov V.P., Volkova G.A., Portnyagina N.V. 1999. Introduction of useful plants in sub-zone of middle taiga. Respublika Komi. V. I. St. Petersburg: Nauka. 229 p.
Trofimov T.T. 1988. Sea Buckthorn. Moscow: Publisher of Moscow State University. 224 p.
Tsar'kova T.F., Latushkina V.A. 1985. Industry culture of Sea Buckthorn and Blackfruit Rowan. Moscow: Central Board of NTO of Agriculture. 40 p.
Vekhov V.N., Gubanov I.A., Lebedeva G.F. 1978. Cultural plants of the USSR. Moscow: Mysl.. 336 p.
Vstovskaya T.N. 1985. Wood plants introduced in Siberia. Abelia-Ligustrum. Novosibirsk: Nauka. 279 p.